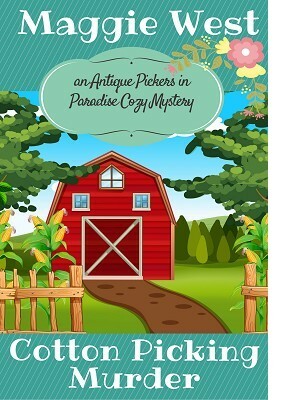 When antique pickers Sherri Green and Carol O’Brien get first dibs on the goods at a farm auction, one of them finds something more sinister. The missing farmer. Dead. Add a shady real estate agent and family and neighbors whose lives would be easier with the farmer out of the picture and you’ve got a puzzle that Sherri can’t help but piece together. Can Sherri and Carol along with the help of Deputy Leon Fletcher figure out who murdered the farmer? Cotton Picking Murder is a clean, short read. It’s perfect for lovers of cozy mysteries that feature an amateur sleuth.